Over the past decade, there have been an average of 50,000 bicycle accidents per year in the U.S. The leading source of these injuries occurs when cyclists are hit by motor vehicles. Every day two people in the United States die in bicycle related automobile accidents, and last year Florida had the most cyclist fatalities in the nation. With the always warm weather, influx of tourists and snow birds, and ever growing population, it is no wonder Florida ranks so high. In Palm Beach County alone, a cyclist is struck by a motor vehicle on average every day. The cause of these accidents includes carelessness, distracted driving, alcohol, and poorly designed roads. When a cyclist is seriously injured due to the negligence of an automobile operator, then the injured party can bring a claim against the driver. As in other personal injury cases, cyclists may recover for their economic or non-economic damages. Economic damages include medical bills, property damage, and lost income, while non-economic damages include pain and suffering, loss of enjoyment of life, and mental anxiety. Distracted driving: The number one cause of accidents in Florida is distracted driving. A driver’s attention can be diverted from the act of driving by a number of things, including texting or talking on the phone, looking at the radio, eating, or using mobile apps. Alcohol and drug use: It is a crime in Florida to operate a motor vehicle while under the influence of drugs or alcohol. Drunk driving is one of the leading causes of car accidents and motor vehicle fatalities in Florida. But it is not just drivers who create dangerous situations when inebriated – 24% of cyclists killed by motor vehicles had been drinking. Importantly, a bicycle is considered a motor vehicle in Florida, so the same laws apply to cyclists. A motor vehicle operator is considered intoxicated and may be arrested if either the person’s blood alcohol level exceeds. 08% or the person’s ability to operate the vehicle is impaired. Drowsy driving: Studies have shown that even moderate levels of sleep deprivation affect driving performance, and even just two hours of sleep deficiency can double the likelihood of getting into an accident. 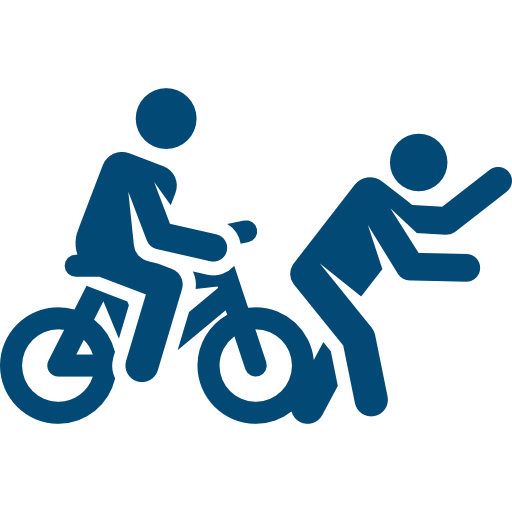 Carelessness: Both drivers and cyclists should always be aware of their surroundings and follow all traffic laws. Speeding and failure to follow traffic signals cause a significant number of injuries and deaths every year in Florida. The roads in Florida were not designed with cyclists in mind. Florida weather allows for cycling year-round. Florida’s wide, flat roads allow for higher speed limits. The bike lanes in Florida are too narrow. Safe Passing Law: When passing cyclists, drivers must provide three or more feet of space between the car and the bike. Helmets: Florida’s Bike Law requires that those under the age of 16 wear a helmet while riding a bike. Adults are not required to have a helmet on when cycling. Moreover, section 18 of the Bike Law states that the failure to wear a helmet may not be considered as evidence of contributory negligence. However, most injuries and deaths in bicycle accidents are caused by trauma to the head, and helmets have been found to decrease head injuries by up to 50%! Headphones: It is illegal to wear headphones while riding a bike on public roadways in Florida, and it can be punished with a fine of over $150.00. The only exceptions to the law are for cyclists who need hearing aids, or for the use of a single earbud with a cell phone. Florida’s Pedestrian and Bicycle Strategic Safety Plan: in an effort to reduce the number of bicycle injuries and fatalities on its roadways, Florida has adopted a comprehensive safety plan that includes a Complete Streets Policy. This policy includes the redesigning of certain roads and intersections, enlarging bicycle lanes, educating the public regarding drivers sharing the roads with cyclists, reducing speed limits, and enforcing existing traffic laws. 1. If you injured, immediately seek medical assistance. Be sure to visit the ER and follow up shortly thereafter with your doctor. Doctors’ reports are a crucial piece of evidence should your case become contentious. 2. Contact the police. Bicycle accidents are one of the most underreported types of accidents, with some research estimating that only 10% of bicycle/motor vehicle accidents are reported by the police. A police report is important because it provides information for your insurance claim, and it can be a significant piece of evidence should the need arise for you to file a lawsuit. 3. Get the names and phone numbers of witnesses. You are the one at the scene, and this may be the only opportunity to collect witness information before it disappears forever. 4. Make your own “unofficial report.” Do not rely on your memory – write down crucial details of the accident while they are fresh in your mind immediately after the incident occurred. 5. Take photographs of the scene, vehicle, your bicycle, and all injuries. 6. Contact an attorney. Get some legal advice from an attorney before you speak with an insurance company. Attorney Shannon J. Sagan will give you a free initial consultation, and getting advice from an experienced attorney may prove to be invaluable before you file a claim. If we take your case, you won’t have to pay us until we get compensation, either by settlement or jury verdict.